Heartbreak is available in endless variety in ultimate. Pittsburgh Temper has found its own unique brand that has reared its head at too many Regionals. In 2015, they took half 8-6 on a Washington DC Truck Stop squad that nearly made the National semifinal later that year. They failed to score a single point during the second half, ultimately losing 11-8 and falling to Philadelphia Patrol in the second place game-to-go. It was an ignominious end for a team that featured the likes of Tyler Degirolamo, Trent Dillon, and the Thorne brothers. It was the beginning of a bleak run for Temper that featured getting eliminated before the game-to-go (2016) and losing in two straight games-to-go against Truck Stop and Patrol again (2017). Looking back at that spate of painful ends, it might be easy to forget Temper’s team quality when they first took the field in 2014. With a record like that at Regionals, you can make a case against #12 Pittsburgh Temper’s early success this season when they got to the final of the Pro-Elite Challenge by beating a very talented and full-strength Sockeye squad. But that marquee win and Temper’s overall regular season performance are also impossible to write off. Before Pro Champs on Labor Day, there was a fairly strong case to be made that Temper was the best team in the Mid-Atlantic. There still is, and a lot of that has to do with Temper’s long, exciting, and sometimes painful effort to put all the pieces together inside the Steel City. For an area so renowned for the college teams it has produced over the past ten years, it may strike you as odd that the city of Pittsburgh hasn’t experienced the same kind of club success. The landscape of Pittsburgh’s club scene is much larger than Pitt, however. For many years, those groups competed on a separate basis. As far back as Thorne can remember, Pittsburgh men’s teams were either comprised of players from University of Pittsburgh who were largely focused on getting more reps before the college season or players outside of that nucleus who wanted to focus on competing with a high level club team. Bridging these priorities was a very important piece for merging the best talent. Every merger attempt made before Temper failed to generate any sort of long term traction. Matters came to a head around the same period that the Pitt men won back-to-back college championships. While many of the Pitt players competed for the club outfit Oakland, Tad Wissel, Ben Banyas, and West Virginia alum Jared Manzo formed Dire Wolf with other players who were determined to compete at the highest possible level. Oakland, who ultimately rebranded as Temper in 2014, and Dire Wolf quickly found themselves knocking on the door of Nationals. When Temper qualified in 2014, they put on a great first year performance with wins over Ring of Fire and GOAT, two semifinalists. With so many young high caliber players and a convincing Nationals showing, Temper had become the premier men’s team in the city. During the offseason, it was decided that Dire Wolf and Temper would merge and keep the Temper name thanks to their finish in 2014. Perhaps it’s no surprise that Temper has failed to get back to Nationals. “I remember, in 2015 and 2016, I was kind of almost dreading those club seasons because the season was so long,” said Thorne. To understand why Thorne and other young Pitt players got so burnt out before the club season even started, you simply need to look at the kinds of teams En Sabah Nur was fielding during those years. Pitt players were putting in an insane amount of time and effort into competing in college. The strain it put on Temper’s Pitt contingent was enormous, as well as a cautionary tale about the strain that playing ultimate almost year-round can put on players. Cohesion at Regionals in the Mid-Atlantic was critical, but, even with stretches of strong play, Temper couldn’t close big games at Regionals. Temper also demanded a lot of utility out of their top players. Both Thorne and coach Andrew Willig noted how one of the big differences this season has been Temper’s depth. “In previous years, we’d play with a rotation of maybe 14 players in big games and maybe that was a mistake by our leadership,” said Thorne. That, combined with a lingering knee injury to Tyler Degirolamo, the team’s best all-around player, made it hard to get those big wins. After the brutal back-to-back losses of 2017, the team reconvened in the offseason to lay an early foundation for the kind of direction they want to head in. “We told everybody to look around the room and trust whichever 7 of our 27 guys will either leave everything out on the field. When they can’t get it done and when they can, they’ll do it with flare,” said coach Andrew Willig. Willig and the team’s leadership had good reason to believe in Temper long before the season began. In addition to the prospect of having a healthy Degirolamo, Temper received an important boost with some very good pickups from Boston Dig and Philadelphia AMP. More than ever, creating a team culture in which every player felt valued was a huge priority heading into the season. Thorne noted how, in previous seasons, the team felt much more cliquey. Part of creating that cohesion that Temper lacked is coach Willig himself. Willig’s preseason vision of playing with trust and flare fit is a good description of Temper’s offense. 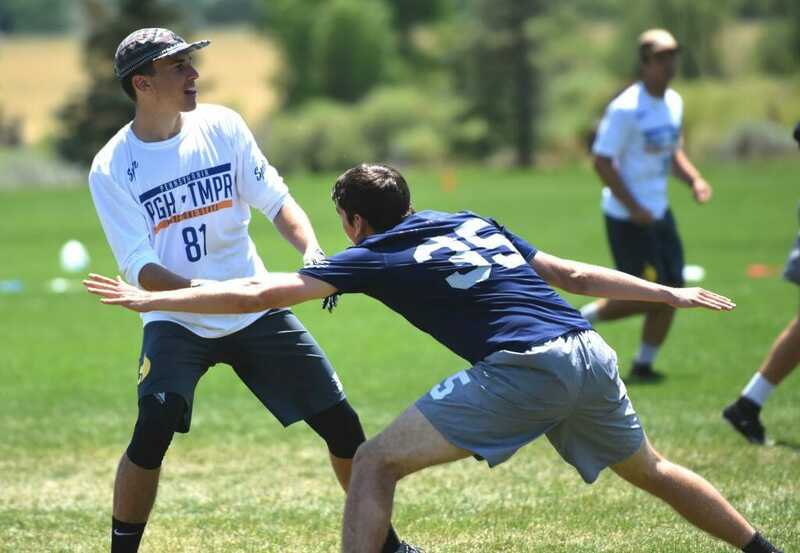 At Pro-Elite Challenge, far and away their best tournament this season, Temper’s backfield — powered by Pat Earles, Jonah Wisch, and Thomas Edmonds — was very aggressive with their hucks. They could rely on an army of athletic receivers to make big plays. They capitalized very successfully on oppponents’ mistakes, showing off what a full strength Temper squad can potentially do down the road at Nationals. Their depth showed in their marquee win against Sockeye, and they also found a mental edge against as the bottom seed at the tournament. That underdog mindset wasn’t really available at the Elite-Select Challenge where Temper’s seeding was the exact opposite: no. 1. “That small mental change was something the leadership addressed but I don’t think we addressed it enough and it’s something we’ve been working on,” said Thorne. Temper’s experience at ESC bears weight when you consider their chances this weekend at Mid-Atlantic Regionals. While they showed some very concerning vulnerabilities against teams that had clearly scouted their offense, they also notched a convincing win against Patrol. That win points to a larger factor that has been driving Temper this season and which will be critical going into Regionals: confidence. Part of it comes from the fact that there are two bids on the line this weekend. That wasn’t the case a few weeks ago. The missing piece from the larger Mid-Atlantic bid picture for most of the regular season was Truck Stop. Before Pro Champs, Truck was sitting just outside the bid cutoff at 17th. That weekend, they locked up a second bid for the region and opened a very realistic second chance for Temper to go to Nationals if they lose in the first place bracket. Temper won the other bid for themselves. Absent a second bid in the Mid-Atlantic, it wasn’t hard to imagine Temper falling to a reloading Truck Stop after the vulnerabilities that Temper put on display at ESC. With two bids in the Mid-Atlantic’s possession, Temper and Truck Stop are the favorites to go to Nationals, just as they were four years ago when the team made its first Nationals appearance. Just like that inaugural season in 2014, Temper can derive confidence and belief from a successful regular season. While the slips of previous seasons are far from distant memories, the adversity they’ve faced before and the joy they’ve found playing together this season have bridged the gap that existed for so long between different teams from Pittsburgh. At Regionals, nothing is set in stone. There are players tenaciously clawing for a chance that will remain elusive for all but the 16 teams that qualify for Nationals. The journey of Temper is one of several stories that has made this particular club season so compelling. It seems serendipitous that one of the focal points for an extremely compelling postseason is the drama set to unfold at Mid-Atlantic Regionals between Temper and the other contenders. For Temper, there really is a sense that the best has yet to come. Comments on "With Trust and Flare: How Pittsburgh Temper Is Back on the Doorstep of Nationals"